Barcelona moved back to the top of La Liga last Sunday after they defeated Villarreal 2-0. Sevilla, Atletico Madrid and Alaves all failed to win this past weekend, leaving the way open for Ernesto Valverde’s men. Real Madrid also returned to winning ways in La Liga with a 2-0 victory over Valencia at the Bernadeau. Elsewhere, Rayo Vallecano spiced things up at the bottom end when they beat Eibar 1-0 at home while Huesca continued to be the whipping boys. There are some cracking matches to look forward to this weekend, including a Catalan derby and Valencia taking on Sevilla. Let’s get straight into this interesting round. Leganes play host to Getafe in a low-profile La Liga match on Friday night at Estadio Municipal de Butarque to kick off round 15. The hosts will come into this game in high spirits following a 4-2 victory away at Real Valladolid to complete back-to-back wins for the first time in this campaign. Lega’s home form has been incredible thus far this season with in-form teams like Barcelona, Atletico Madrid and Alaves all failing to win at this ground. Getafe were brilliant in gameweek 14 when they thrashed Espanyol 3-0 at home. That was the visitor’s fifth win of the season and they are now four points clear of their opponents. Leganes have been hard to beat at home so I’ll back them not to lose - take the Home/Draw Double Chance at 4/10. Atletico started gameweek 14 two points shy of table-toppers Sevilla and a win would’ve sent them to the top of La Liga. Los Colchoneros failed to take advantage of the situation and dropped two points instead after coming from a goal down to salvage a 1-1 draw at Girona. Diego Simeone’s men return to their favourite Wanda Metropolitano stadium where they are unbeaten and have conceded only four goals in seven matches. Alaves are also enjoying a successful season thus far and they won’t be push overs. The visitors are one point behind their opponents and they would be pleased with a point here. I’m expecting a low-scoring defensive game but I’d give it to Simeone’s men to edge it. Take Atletico Madrid to win and Under 2.5 Goals at 9/10. Valencia’s bad start to the season saw them get knocked out of the UEFA Champions League last week and Real Madrid rubbed salt in the wounds when beating them 2-0 last Saturday night. Prior to the Madrid defeat Los Che looked to have gained the right momentum by registering three consecutive league victories. Sevilla missed out on a chance to go top of the table when they drew 1-1 with Alaves. Pablo Machin’s men are now one point behind at the top of the standings coming into the 15th round fixture against Valencia - a team that took six points from them last season. This is a hard match to call so I suggest backing Both Teams to Score at 13/20. Villarreal will be desperate to return to winning ways after picking up just a single victory in their past eight games in all competitions. They were easily beaten last weekend at the Camp Nou. They host Celta Vigo in one of the most open fixtures of the round on Saturday evening at Estadio de la Ceramica. The visitors needed a confidence boost last time out when beating the league strugglers Huesca and keeping a clean sheet is what they needed most. The Yellow Submarine have been very disappointing this season and it’s not a mistake that they’re 17th on the log. Take Celta Vigo to cause an upset at 33/10. Barcelona took advantage of Sevilla’s slip-up to go top of the La Liga standings after returning to winning ways. 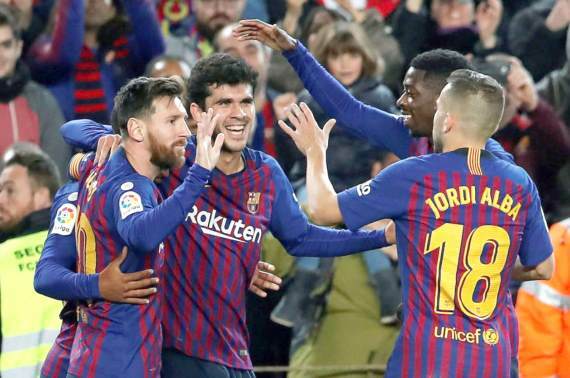 The Catalan giants dispatched Villarreal 2-0 last weekend at the Camp Nou thanks to a 36th-minute strike from Gerard Pique and 20-year-old Carles Alena sealed the victory two minutes from time. Espanyol started off brightly and they were amongst early contenders but their recent form tells a different story. The Blanquiazules ruined their good start and now find themselves on three consecutive defeats, including last week’s embarrassing 3-0 loss to Getafe. Barcelona are a banker here and 11/20 is a good price. Eibar will be hoping to rebound from the disappointing loss to Rayo Vallecano on Sunday’s early fixture when they host Levante in a middle-of-the-table battle. José Luis Mendilibar’s men come into the clash as 9/10 favourites even though they’ll be playing one of the strongest travellers in the league. Levante have picked up 11 points on the road from seven matches with three wins, two draws and two defeats. This match is closer than the betting board suggest, back Both Teams to Score at 13/20. Real Madrid will have a nice opportunity to get back-to-back league wins after their embarrassing 3-0 defeat away to Eibar when they travel to rock-bottomed Huesca on Sunday. Los Blancos will play their first ever league match at the 7600 seater stadium where they will be expected to run riot. The newcomers should be no match for the European champions, despite Solari’s men having one of their worst starts. Take Real Madrid on the (-1) Handicap at 8/10. Strugglers Sociedad and Valladolid are set to take on each other in a low-profile mid-table clash at the Anoeta Stadium. Both team have been blowing hot and cold since the start of the season. The host come into this match on a record of five wins, four draws and five defeats whilst Valladolid’s record is almost similar with four wins, five draws and five defeats. Because of home ground advantage, back Real Sociedad to claim maximum points. In-form Real Betis will look to extend their good run when they host league strugglers Rayo Vallecano. Betis have won three of their last four matches, including that incredible 4-3 victory at the Camp Nou. At home, they have been fairly decent with three wins and two draws from seven matches. Vallecano will come into this game much more improved after registering their second win of the campaign when beating Eibar 1-0 at home. Despite their recent win, Real Betis should still be too good for Vallecano at home. The Lions will be hoping to rebound from a tough 3-0 loss to Levante on Monday evening when they host the in-form Catalan side to wrap-up gameweek 15. Despite not winning a league game in their last 12 matches, Athletic Bilbao come into this clash as surprise 9/10 favourites. On the other hand, Girona are unbeaten in their last eight games – including a win at Valencia and a draw with Atletico Madrid. Girona are a team that can upset anyone, back the Catalan boys to win at 32/10.